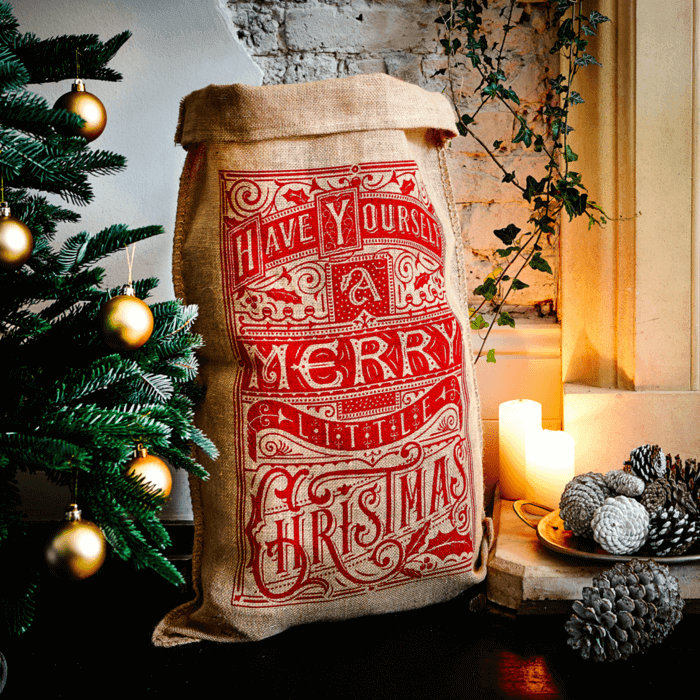 This ornamental design features a traditional festive message typed in a mixture of fonts and is printed in red on our classic hessian sack. Measuring 80 x 53cm and complimented with one metre of branded crimson satin ribbon to tie round the top. The red print on brown really stands out. I have purchased this to give to my partner and I’m sure he will love it as much as I do. Delivery was ok, could have been slightly quicker but won’t complain too much as happy with sack! All of your sacks have a traditional feel but for me this this just screams Christmas! Much love and thanks for great products year after year. Amazing quality for a very reasonable price! Great buy. Purchased this 2017 for my teenage daughter. Wish you had been around in 2000, it would have made her Christmases even more special! Can’t praise quality and design enough, and love the storage tube, also very high quality. Well done for providing us with a fantastic product made in the UK!!! and long may you continue.